'Wholand' Residents are too noisy. I find it incredulous that the article ''Pranksters Find Happiness in Shelton'' (July 17) could find its way to the pages of The New York Times. Glorifying such childish behavior is not what I expect from the Times. However, if you feel this type of journalism meets the needs of some of your readers, in all fairness your reporter should have presented the neighbors' view of ''Wholand'' in more than a three-sentence paragraph. 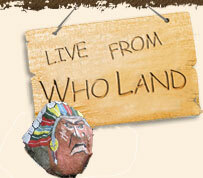 Contrary to what your article states, ''Wholand'' unfortunately is not ''isolated from the rest of the world.'' Having spent many weekends visiting family who live within hearing and viewing distance of this purported ''Wholand,'' I concur with the statement that ''Wholand is known for its drinking and revelry.'' However, this so-called ''fun'' is at the expense of their neighbors, who are blasted by bugle calls anywhere from midnight to 6 A.M., bombarded by fireworks that waken and frighten the children long after they have fallen asleep, and forced to listen to deafening music and shouting that is ongoing 24 hours a day. Everyone loves a good time, and that includes the decent, peaceful neighbors of ''Wholand.'' But when these neighbors are put in the position of seeing what was once a lovely, family-oriented area turned into a haven for over-the-hill hippies and potential candidates for Alcoholics Anonymous, we all hope that instead of ''perfecting their act,'' the ''who- cares'' of ''Wholand'' will grow up and clean up their act.